I wouldn’t miss an opportunity to celebrate the 20th anniversary of The Little Nell’s Grand Award and all of the talented individuals that have helped shape the Nell’s legacy in the wine world and served as inspiration and mentors to me throughout my career. Right around the time The Nell first received the Grand Award, I was the wine director at The Greenbrier Hotel and subsequently The Inn at Little Washington. During the nine years I spent in rural WV and Va., I would scour wine lists around the country for inspiration. The Nell, The French Laundry, and Frasca were three of my go-to’s. When I was moving to NYC, I came across a hard copy of one of the original lists Richard had written at the Nell, that was dog-eared from flipping through it so frequently. Reading about people like Bobby, Richard and Jay showed me that a career in wine was possible. Today I am honored to call them friends and mentors. I am grateful to them for the doors they helped open and the advice and coaching they provided me along my journey. They were the mother yeast of an extremely rich wine culture that was built around accessibility rather than exclusivity and that culture was both guest and industry facing. It was that culture that reinspired me and supported me along the way to resume my wine studies which I had consciously left behind when I moved to Colorado. Aspen is a very competitive town, I got better at snowboarding, road biking, and mountain biking by training with others. They challenged me and pushed me harder that I could push myself. It is that same passion and perseverance that all these great professionals also applied to their wine studies. It was Jay that talked me into getting back into wine and it was Dustin and Carlton that really helped get me across the finish line while studying for my master sommelier exam. I cannot emphasize the importance of the entire Colorado sommelier community with people like Bobby, Richard, Jay, Jonathan, Dustin, Carlton, Chubby, Brett, Damon, Shawn and so many more that have over the years helped establish the Nell a truly one-of-a-kind wine destination not only in the United States but in the world. Each generation of sommeliers respectfully evolves upon the great work done before them, invests in the team around them, and serves as ambassadors of The Little Nell as they continue to pay it forward to the sommelier community long after they have left the floor. I am grateful for my time at the Nell and the opportunities, and friendships it has provided me with over the years both personally and professionally. BACK IN 1997, a Clinton was in the White House, a quarterback named Elway was still looking for his first Super Bowl ring and the iPhone was simply a notion in Steve Jobs’ noggin. Closer to home, The Restaurant at The Little Nell hotel was honored for the first time by Wine Spectator with their Grand Award for having one the world’s greatest restaurant wine lists. The world has changed in the past two decades, but one constant that endures is the excellence of The Little Nell’s wine program. This July, the Spectator once again deemed The Little Nell’s restaurant, now known as Element 47, worthy of recognition. In fact, each and every year since that first Grand Award in 1997, the restaurant in the Nell, be it known as The Restaurant at The Little Nell, Montagna, or Element 47, has been named by the magazine as one of the elites. To put that into perspective, consider that each year Wine Spectator reviews the wine lists of over 3,500 restaurants around the world. This year, just 89 were named Grand Award winners. That puts the Nell in the top 3 percent of all the lists surveyed. Other restaurants so honored that you may know include Emeril’s New Orleans, Spago in Los Angeles, Daniel in New York, Blackberry Farm in Tennessee and Aureole in Las Vegas. All impressive, but none of those have longer standing as a Grand Award winner than The Little Nell. Deservedly, The Little Nell is planning a celebration worthy of their 20 years of excellence. On Aug. 17, Element 47 will host an extraordinary wine and food pairing party to revel in its victory. “In commemoration of this historic achievement, we are preparing one of the most special dinners ever planned at The Little Nell,” said Carlton McCoy, who in his role as wine director of the property is the current steward of this decades-long legacy. McCoy will be joined in this singular celebration by a cadre of exceptional sommeliers, who are both alumni of the Nell and great friends to those who have lived in Aspen the past 20 years. “We have invited several of the sommeliers who played a part in earning this award over the past two decades to join us in service and as guests at the dinner,” McCoy said. Star somms Rajat Parr and Robert Bohr will also be attending and pouring wines. In addition, executive chef Matt Zubrod of Element 47 will be welcoming one of the most innovative chefs in the world, Francis Mallman, to the restaurant’s kitchen for the special evening. The Argentine “God of Fire,” Mallman will captivate the assembled with his famed Patagonian barbecuing skills. Zubrod is justifiably giddy about working with Mallman. Mallman in the mountains is not to be missed. The evening will commence in the manicured poolside gardens of the Nell’s terrace with passed hors d’oeuvres from the two chefs, as Mallman stokes the fires for the main course. A signature cocktail, Fennel Delight, with grapefruit and Roca Patron will set the mood. Dinner will be served inside Element 47 and while the cuisine will be notable, the focus, appropriately, will be on the wines and those pouring them. “More than 50 wines, hand selected from our cellar, will be poured from the greatest producers of the world,” McCoy said. Wines on offer will include selections from Domaine Dujac, Jacques Frederic Mugnier, Domaine Leflaive, Domaine Armand Rousseau, Giacomo Conterno, Soldera, Chateau Rayas, Guigal Cote Rotie, La Mission Haut Brion, Schrader, Gaja, and Domaine Roulot. 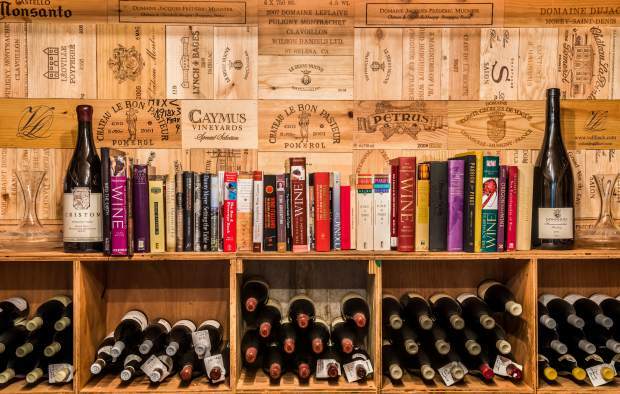 That is an all-star list of many of the most prestigious wines on the planet. To taste them at one time, in one place, is well, grand. Of course, 20 years of honors can only result when people labor to excel. The wine team at Element 47 with McCoy — Csaba Oveges, Chris Dunaway, Erik Elliott and Jesse Libby — currently continues the tradition of hard work and intense attention to detail. But part of what will make the evening so special will be the return of those earlier sommeliers who established the initial standards. Returning to the floor for the celebration will be Aspen’s Jonathan Pullis. Dustin Wilson, a star of the film “Somm” and the man who honed the list at Eleven Madison Park into a Grand Award winner before opening an innovative NYC wine shop called Verve, will be coming back to the Nell, as well. But, perhaps most appropriate for this event will be the return of Bobby Stuckey, who was the sommelier at the Little Nell in 1997 when the Grand Award was first acquired. Stuckey wrote the essay to the Spectator that began the streak of success. He will come over the hill from Boulder, where he runs Frasca Food & Wine, his epic, Italian wine-centric restaurant that has been a James Beard Award winner for Outstanding Wine Program. “Mark Pape (an earlier Nell sommelier) had originally applied for the Grand Award but the next year I put together an essay that explained how we were changing from a Bordeaux-based house and incorporating wines from Burgundy and some cult wines from California. I talked about our Riedel stemware, which was new at that time and our education program,” Stuckey remembers of those heady days. The issue came out that fall and everything changed. Each of the former Nell sommeliers above, including McCoy, are among just 236 people worldwide who wear the pin designating them as a master sommelier. This is not a coincidence, as the Nell has come to be known throughout the wine world as the cradle of master sommeliers. Ten masters have come through the property as employees at some point in their careers. An unprecedented number for any restaurant. The Nell also has often served as the location for the diploma exams administered by the Court of Master Sommeliers to those who are attempting to achieve what is one of the most prestigious and arduous wine honors, master sommelier. As a result, the property has a near mythic reputation among those in the wine world as not just a place that sells great wine, but as a temple on the Wine Mount. In fact, the focus on wine education is an obsession shared by the entire Little Nell staff. Forty-one members of the culinary team have taken, and passed, at least one level of the Court of the Master Sommelier exams. It is this confluence of factors that has made The Little Nell not just a global wine destination but a key part of both Aspen’s identity and Aspen Skiing Co.’s luxury branding. The most important thing about Skico’s rich legacy of wine excellence is the impact it has on the diners and guests who come to The Little Nell. Consider for a moment the many post-ski suppers that guests of the Nell have enjoyed over the past 20 years. Think of the wedding toasts that have been made in the gardens or the successful wooings fueled by glasses of wine in the Living Room, or the business deals that have been consummated because of a bottle of Burgundy at the bar. It starts to become clear that the men and women of The Little Nell’s wine program, and the wines they pour, help shape the social fabric of Aspen. It is about more than awards and honors. It is about making people happy. Something the Little Nell Wine Team has done, grandly, for over 20 years.